I seem to be in a “decor” mood lately, but I have been doing some sewing here and there. This is not one of those sewing projects though. It’s another art. 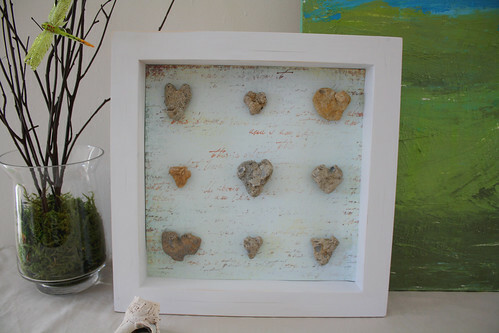 I was very inspired by this stone heart wall art I found on One Pretty Thing and decided to make my own. I found the rocks in one trip to the beach. I then found a unfinished wood 12×12 display box at Michael’s (normally $7.99, but use your coupon!). I painted it white (2 coats of spray paint), but then decided I wanted to distress it some. Do not use spray paint if you want to distress. It was not the easiest, but I did some. I took a pizza cutter to it and sanded some spots to show the wood. For the inside, I glued in a piece of scrapbook paper and then glued on the hearts. Super simple. 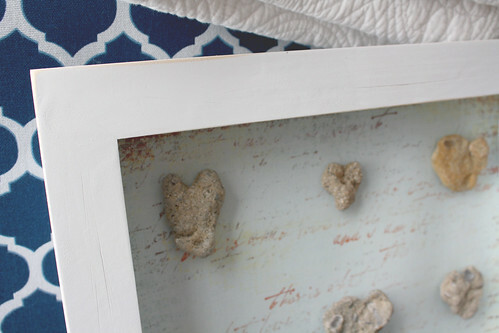 Here is a fab tutorial on distressing a small thing that I found and would use if I was to do this again. What a great idea!! That is amazing that you found all the rocks in one trip! Oh wow. That is so sweet! Heart rocks. How very clever. Thanks so much for sharing! I love this! I have wanted to do this with shells we have collected from different beaches and label each beach under them. Yours is so pretty! Thank you for the distressing tutorial. I would have never thought of that. I love it! 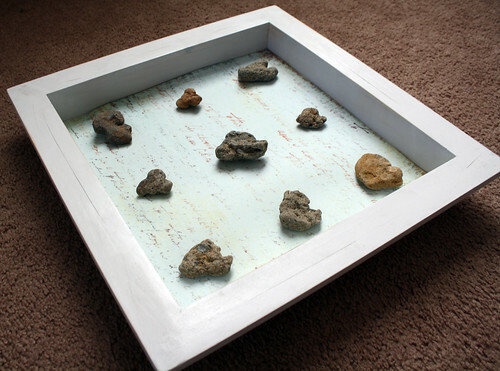 Your rock display is beautiful. this is really pretty! but wow, how long did it take to find heart rocks?! i always look and never have any luck. A pizza cutter?? You are a genius!! That is so cute, I love the heart-shaped rocks!! I watched all your blog and I need to say.. I love U :d You’re queen of diy! love it, thanks for the tip on spray paint not distressing well, didn’t know that! so the rocks were already shaped like hearts!?! Wow. I love this! !